PC bugs, crashes, incompatibilities, and security vulnerabilities are often caused by out-of-date software. What do millions of desktop and laptop users have in common? I’ll give you a hint: You are busy with some activity on your laptop and a message pops up informing you that one of your software programs or tools needs updating. If you are like most people, you hit the ‘Remind Me Later’ option, and keep doing what you’re doing. Later often never comes. Does that sound familiar? There’s a word for this: Procrastination. And we have all been guilty of it when it comes to the chore of updating our PC's software. If you have procrastinated about updating your software it could come back to bite you. “In the online world, your security habits, such as keeping your software updated, play a big role in the level of your protection on the Internet", said Ondrej Vlcek, Chief Technology Officer, GM, and EVP Consumer Business at Avast. Dear reader, don’t beat yourself up too much. Researchers behind the Avast PC Trends Report (PDF) found that the average PC owner has 49 programs installed, including well-known applications like Firefox, 7-ZIP, Java, and iTunes. Staying on top of 49 programs is just too much to ask of anyone – even the most security-conscious person. “We recommend people get into the habit of doing a regular status check on their PC, use an automatic software updater tool like the one we provide in AVG TuneUp or Avast 2017, and make sure their AV is always kept up-to-date,” advises Vlcek. Our researchers found that more than half (52%) of the most popular PC applications, including Flash and Java, are out-of-date. Some software makers know human nature better than others, and include built-in updaters. This helps keep more than 70% of their user base updated. 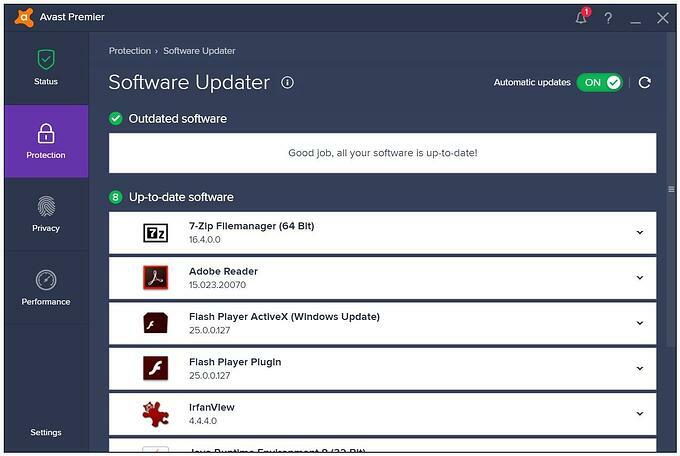 You can easily update the software on your PC by using the 2017 version of Avast which includes a Software Updater. To start it, open the Avast dashboard and go to Status - Smart Scan. If you have outdated software, the program will let you know. Get the real world picture of the most used applications, which hardware is the most popular, which software is outdated, and more by downloading the Avast PC Trends Report.